Football is a pretty rough sport, there's no denying that. The hits can be positively bone crushing. . . literally! While there haven't been any football deaths directly caused by on-field injuries, there have been some pretty shocking football accidents that will make even the toughest fans cringe. But there are some people who can't help watching these kind of football player injuries on the field, and those people might be wondering which are the worst football injuries of all time. Wonder no more, because this collection contains pictures and descriptions of the sport's most gruesome blows. With all the hits to the head, broken limbs, and neck injuries over the years, some people may be surprised that there haven't been any deaths. Football equipment has progressed drastically over the years, and even now the league is pushing for better concussion policy. That being said, its hard to keep injuries out of such a physical sport, and many players pay the price. Be warned, the footage shown here is incredibly graphic, and not for those with weak stomachs. After all, these are the worst nfl injuries of all time, so be prepared for some hard hits, broken limbs, and even a little blood. Ronnie Lott was a rough and tumble kind of player all throughout '80s and '90s, and he's still renowned for some of his plays even today. Unfortunately, one play he is known for is hardly pretty. During the 1985 season, on December 22, Lott was playing hard in a game against the Dallas Cowboys, when an awkward collision crushed his pinkie finger towards his chest. The blow almost completely severed his finger, and both flesh and bone fragments were left on the field as he went running off. Witnesses couldn't initially see how bad the injury was, but doctors saw quickly enough that it was going to be a long recovery. Lott had two decisions. They could either fill his hand with pins, and graft bone from his wrist, which would be an intensely long recovery, or he could have it amputated just above the first joint. Lott chose amputation, and still went on to play football, minus the tip of his finger for almost another decade. The Joe Theismann injury is one of the most famous in football history, and it's also one of the most graphic. On November 18, 1985, the New York Giants were playing against the Redskins, and they were part way through the second quarter when something awful happened. 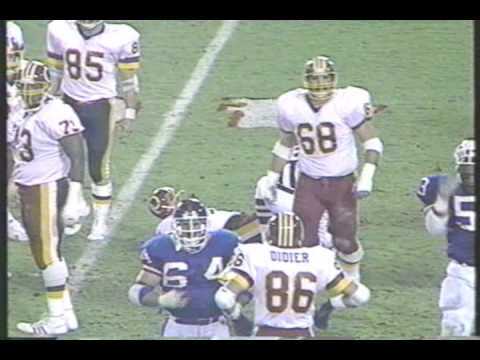 The Giants went for a blitz, and Lawrence Taylor came barreling into Redskins quarterback Theismann, dragging him down for the sack. 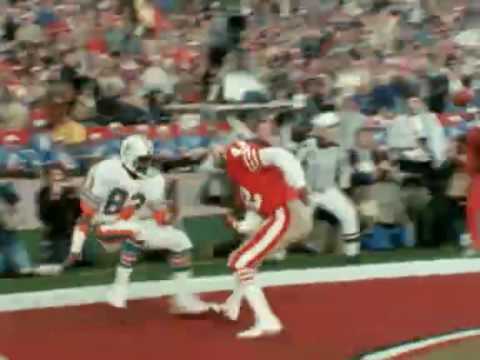 As it happened, Taylor's knee drove into Theismann's leg, shattering it in a spectacularly graphic way. Taylor instantly began calling for help the moment the play was over, rather than celebrating the hit, and viewers watched on national TV as Theismann lay on the field. The play ended Theismann's career and left him with one leg permanently shorter than the other. There are times when you just have to acknowledge that the human body is not supposed to bend that way. 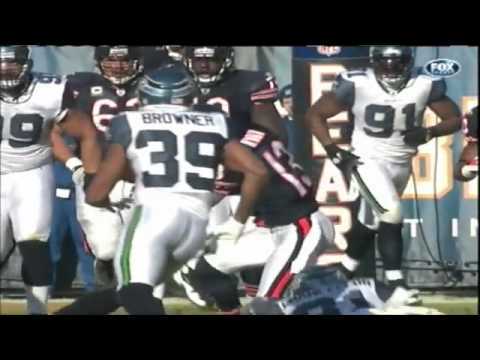 Such was the case with Johnny Knox in a 2011 game against the Seattle Seahawks. Knox was running the ball up field, when he fumbled as Kam Chancellor knocked the ball loose. He tried to leap onto the loose ball, but as he slid forward, he hit Hargrove, who was also trying to recover the fumble. The impact sickeningly bent Knox's torso in half, so his back was touching his rear. The injury caused Knox permanent nerve damage, and he needed surgery to fuse parts of his spine back together. He never returned to the NFL. 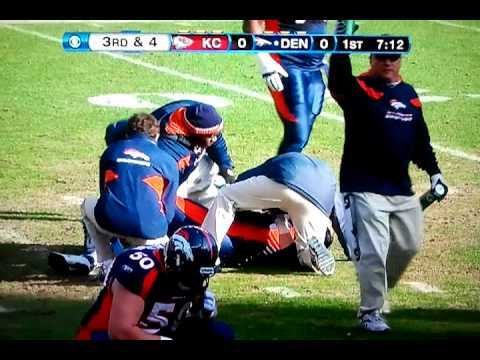 During the Bronco's last regular season game of 2011, Kuper was on the receiving end of an awkward hit by the Kansas City Chiefs. As players came together, Kuper's leg was twisted and broken, to the point where his foot was pointing in the opposite direction of his other foot. You can't initially see what breaks Kuper's leg, but in the replays it's pretty obvious where things go horribly wrong. The injury required surgery and Kuper's game was never quite the same, though he didn't retire until 2014. As you watch the video, pay attention to the reactions of his teammates and the opposing players in the first few seconds. You can see some of them turn away and grab their faces, feeling sick from seeing how bad his leg looks.